Please only use this thread if you're "in". It'll be an easy way to keep up with all that want to play this year. *Members must show what weapon they'll be using prior to the opener of gun season. *Any member taking a deer with their handgun, must attach a picture of that deer, with them and their handgun in the picture. A kill submission must be posted within 5 days of the kill - no exceptions. Scoring will be this. All does will score as 10 points. All bucks will score as 5 points, plus the number of points x 2. (i.e. a 4 point buck would score 13 points, a 6 point buck will score 17 points, etc...). I want to do it this way to discourage people from shooting small bucks to just "score" when a doe will score just as well. The bigger the buck you hold out for, the better your score will be. Take does to rack up a score. Teams will be consisted of either 2 or 3 members depending on how many are going to participate. Teams will be drawn from a hat. The sign-up deadline is Oct. 1st. Each time we get 10 members saying "I'm in", I'll PM them my address so that they can mail me their entry fee. Each member replying with "I'm in" I'll add their name, in red, to the "Folks that are participating". Once I have received their entry fee, I'll change their name under the "Folks that are participating" heading to green - which will show their money has been received and that they are good to go. At the end of the deadline, all paid members names will be put into a hat and names drawn for teams. Teams will be announced shortly after the deadline. As for prizes. Each participant will pay an entry fee of $20. After all have paid, I'll put the money back and split it on a Cabela's Gift Certificate to each winning team-mate. Or, a money order -- whichever is preferred. * HandgunHTR is donating an Apex Predator Holster Harness for biggest buck. * 11P&YBOWHUNTER is donating a Cabela's 4.5-14x50mm Alaskan Scope to the member who shoots the most adult does. * Will-dawg is donating a .50 caliber CVA Buckhorn Magnum muzzleloader topped with a Redhead 4x scope as a participation prize. Once all paid contestants have been named, one name will be pulled out of the hat to receive this prize. * Apex Predator has donated a red-dot site for a participation prize! * F14Gunner has donated six 10-n-1 tools for the 1st, 2nd, and 3rd place teams! * Special K had donated a Leatherman BLAST multi-tool for the first buck entered with 3 points on one side, 1" and longer. I'll also try and round up more prizes and donations for additional prizes. If anyone participating has something laying around the house they no longer need or use, and want to offer it up as a prize, thank you. It will be appreciated. Last year we had quite a few nice donations! I don't want this to be a headache, but rather a fun little challenge to get more involved with handgun hunting. I know it's easy as pie to cheat in this, as anyone can take a deer with a rifle, and then add in the handgun, but I'd also like to think most here are honest and aren't taking this challenge THAT seriously enough to want to cheat at it. I'm in! Here is what I'll be using. Taurus model 44, 6 1/2" barrel, and red dot sight. I'm changing to a scope though, does it matter? I don't have any current pictures of me or my handgun since I swapped scopes out on it, so I'll get some today. I'll try to get some pics tonight, I don't have any here at work. i will be using these the top one is 7-30 waters and the next 2 are 44 mag. i have changed the grip to a pachmayr decelerator but haven't had a chance to get new pictures. Count me back in this year! I'll be sporting the ol' trysty Vaquero back to the woods! I'm in. Will post pics of my pistol later. Folks, special K and his son have been a "team" since the start of this challenge. He pays 2 entry fees so that he and his son are covered. If anyone has a problem with it, please voice your concerns. If not, he and his son will be a team, and others will be drawn. I seriously would hope no one would have a problem with that..
That's always been the consensus, but I still gotta throw it out there so no one can say "I didn't know that!!". Good group of folks here and so far, this challenge has been fun every year! I am in and will be donating a nice prize for the most adult doe by a single person. I'm in! I look forward to it guys. This will be my first year hunting with a pistol. I will post pics of my gun tomorrow. I have pictures of it on my work computer. Here is mine a Ruger Red Hawk 44 Mag with a Leupold Scope. I spent yesterday at the range getting my stuff sighted in. As for guns I will be using a Contender in .30 Herrett another in 6.5 JDJ and another in 7-30 Waters. I will also be using a Ruger Super Redhawk .44 Mag. Contender in 6.5JDJ - Burris 3-9x scope. This will be my primary weapon this year. This is an old picture. The barrel has now been finished in dark grey by Oxford Armory and the scope and base have been painted dark grey (textured) by me. Contender in 30 Herrett - Tasco Pro-class 4X scope. 7-30 Waters Contender Barrel - Weaver 2.5-8X scope. I may take this one out too. Remington XP-100 7x47 - Bomar sights. Built by Jack Dever. And I may get a hair up my rear and take this one out for a spin as well. Pietta copy of a Remington 1858. Someday in the hopefully near future, I'm gonna scratch it! Hate I missed your call the other day! OK, here is my set up and what I'll be using this year... same as last year, except for the scope. S&W 629 Classic - 44. rem. mag. 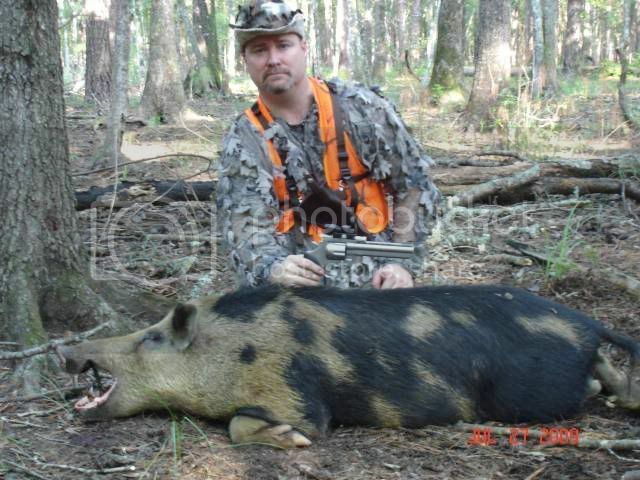 - topped with a Bushnell Elite 3200 2x6. When it gets to be too much, just let me know. I know people.